“Your Star Was Shining” is a gloriously tuneful collection of rock-songs with an emphasis on songwriting. “Swandive” thumps with a cool T-Rex swagger, while “Nightmare Blues” pulses like Jimmy Reed meeting Stereolab at the crossroads. Everybody loves a Roxy Music cover tune. Commuters, dashing through the London Underground will deftly dodge the pony-tailed busker yowling “Fire And Rain”. But these same harried nine-to-fivers will screech to a halt and even miss their train, for Roxy’s “Virginia Plain”. Ask Jeff Davis. On an extended London visit to collaborate with legendary guitar-friend Andy Gill (Gang of Four) in 1999, Davis spent daytimes in the King's Cross Underground, singing tunes from the satellite-radio station in his head. One Tuesday, Davis’ version of the Roxy classic “Mother of Pearl” KO’d fellow-busker Fergus Griffin on Platform 2, and Griffin’s 4:40 to Brixton left without him. Pulling his guitar from its case, Griffin joined in on the chorus, and their collaboration began. The three eventually returned to the US, settling in San Francisco and forming Niagara. Releasing Niagara 01 and Niagara 02, they became San Francisco rock-club favorites and rock-press darlings. In 2004, Davis and Griffin set up camp in a friend’s mountain cabin in Woodside California. There they began work on a set of new tunes. Inhaling inspiration from Neil Young’s barbeque down the hill, they conceived their new band, L’Avventura, and composed the songs that would become that band’s debut, “Your Star Was Shining”. To capture these songs on tape, the three enlisted legendary San Francisco producer Bond Bergland, and friends like producer Jeff Saltzman (Green Day, Two Gallants, The Killers) and drummer Michael Urbano (Sheryl Crow, Cake, John Hiatt). 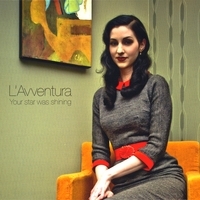 As the studio arrangements took shape, the trio grew to a 7-piece, and the debut L’Avventura LP emerged. “Your Star Was Shining” is a gloriously tuneful collection of rock-songs with an emphasis on songwriting. “Swandive” thumps with a cool T-Rex swagger, while “Nightmare Blues” pulses like Jimmy Reed meeting Stereolab at the crossroads. “Olivia” finds Brian’s Eno and Wilson in a wild surf-battle, while Nick Drake conjures the Fool On The Hill in the acoustic gem, “Rocket Sue”. L’Avventura. Stories. Sonics. Harmonies. Hooks. Pay attention: this format could catch on!